What am I supposed to “do” ? We had a full room this morning . 55 strong. God showed up! We all struggle with habitual sins we cannot seem to stop. 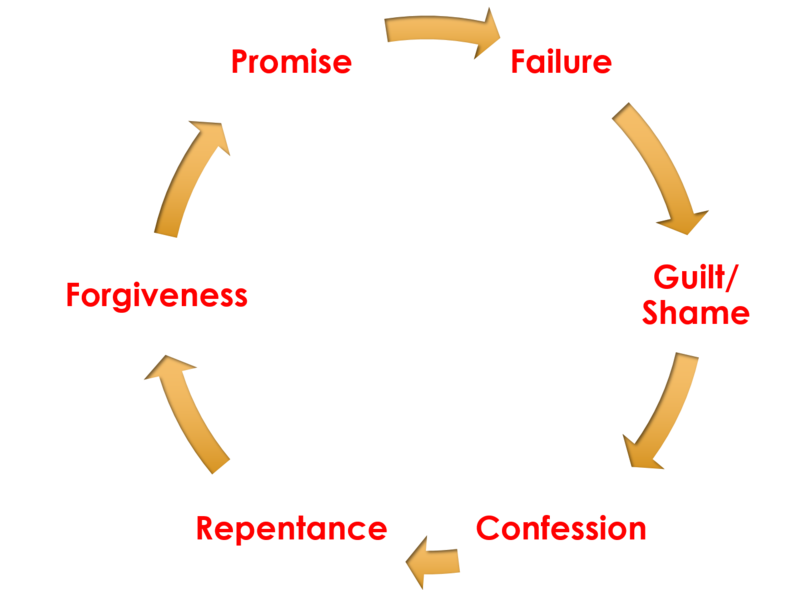 And you know, as you go through this cycle, it really turns into a downward spiral. The more I repeat the sin, the deeper into my guilt/shame I go. “The answer, thank God, is that Jesus Christ can and does”. Romans 7:25 MSG. Christ can “do” it. You cannot. I cannot. In my power, I cannot overcome this habitual sin. The cycle will defeat me as it always has (or else I wouldn’t now have this habitual problem!). But… but … Christ can. And He does that by shifting how you look at this. Stop focusing on the “doing” and start focusing on what you want to “be”. Focus on the “being”. It’s a small step towards a big sanctification. The cycle above is me-focused. My ability or inability to stop, my failure, my shame, my repeating the same cycle over and over. By instead turning inward from my ability to overcome this, it is turning outward to Father and letting Him show you what it is He wants to sanctify and teach you. The answer isn’t what you need to stop doing. It is, instead, a process of looking to what kind of man you want to be. Nick reminds us that our desire for being will determine our actions. Do you see it? The cycle above is all about our actions changing our being. No. Wrong. That won’t do it. Your actions are what got you in that cycle in the first place. You cannot conquer habitual sin with “doing”. No, instead it must come from what you want to be. What kind of man do you want to be? What kind of man does God want you to become? Harrison Mills stepped UP. He took the step of saying, “I have gifts and skills that I can use to make a real contribution to this Tribe” and he boldly tackled the redesign of our logo. I love this on so many levels. He has sat and listened and taken in what has been shared. He’s grabbed the vision. God is clearly moving on his heart and he took the risk of saying, “Hey, maybe I can improve some things and make a contribution”. Amen and Amen. Bold. Creative. Willing to risk. Dreamed. In so doing, he was LivingUP. We’ll be redesigning the website to incorporate all of this. here are the slides from today … wide awake – create there is some good info in these slides that I won’t cover below so take a look. You have the ability to create. You were created to create. To vision. To dream and then act. So let’s get that out of way right up front, this is for you. You can create. You are a creative. Don’t believe the lie that you aren’t. You are. We all are. Gary Player is one of the best golfers in history. But his story is much deeper than golf. He’s an avid rancher and golf course designer. On his South African ranch, he built steps in a mountain so he can climb the mountain. His own, personal “stair master”. He does 1,200 sit ups a day…with a 100 pound weight on his chest. He’s 77 years old. 70% vegetarian and he wants to get to 85%. He eats no bacon, no sausage, no butter. “If you don’t watch you eat, you’ve had it. Period.” He loves America but says obesity is going to kill the American dream if we’re not careful. At 77 years old, he takes no medicine at all. Not one pill. Would you give “anything” to look/feel like Gary Player at 77? Gary Player “created” this life. He had this vision of what he wanted his life to become and it was so compelling that it got him up at 5am every day to hit thousands of range balls – hit so many that his hands bled. Every day. He had this vision for being in fantastic shape and so he was caught lifting weights before the US Open back in the 60’s. No one understood him. But he understood where he was going and here 50 years later, he’s a rock, a fortress of a man. To live a life that takes your breath away, you have to be willing to get winded. If you have a dream of what your life can become, you’re going to have to work at it. God’s just not going to hand it to you. We need to live that dream. Once you grasp it, once you have an idea of what you can become, it will overtake you. It will warp you. You will not sleep like a baby because you can’t get this dream off your mind. It will spring you out of bed early in the morning. And despite what you may think, you can live a life worth remembering. It is there for all of us. Not to draw attention to ourselves. We shouldn’t be driven to achieving fame but rather to greatness. Doing something in life that will effect the entire course of human history. And just when you think, “it’s impossible for me to effect human history”, consider this … effecting one life can impact history. You can change the course of another man’s life and that can change history. So a few of us went on Sunday morning to work at a man’s home that had two huge oaks fall on it a few weeks ago. They almost destroyed the house and he has no insurance. By the time we got there, Ron Lucas and others had helped him get the trees off the house and get his roof repaired but the back yard is a disaster. 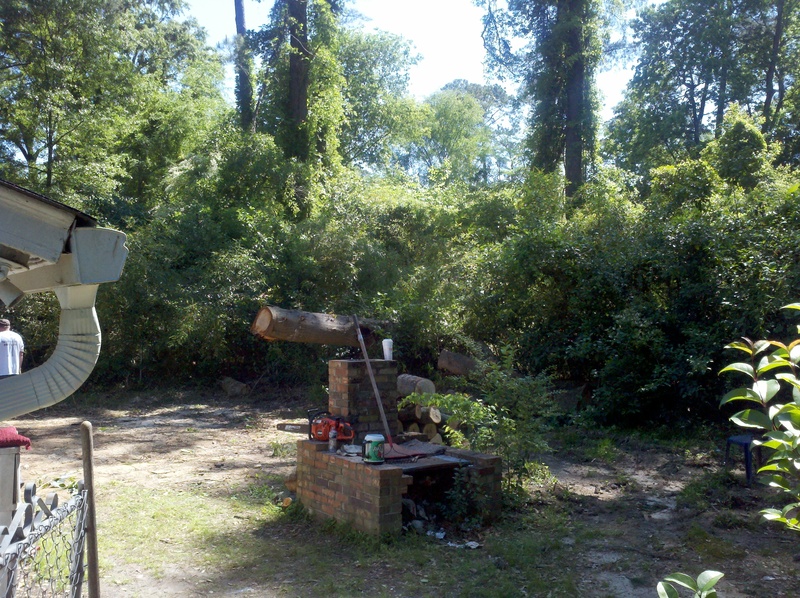 We worked for a few hours putting chain saws to what we could. We moved tons of timber out and made good progress but as you can see, the yard is still a mess and there are two huge trees we couldn’t tackle. He was so appreciative and thankful for the outpouring of undeserved grace. The whole time I was working this dream compelled me to the question of “what if”? What could we create for this man? I visioned getting those big trees out of there by calling in some favors of a tree company. Of getting in there and clearing out all the overgrowth. Of building him a new fence. Of sodding his backyard and maybe building him a patio around that outdoor fire pit his Dad built for him. Of some flower beds. Of fixing his front yard and taking down the dead tree there. Of fixing his outdoor shed. In my mind I was painting this image of creating him a new yard, of giving this man some hope so when he comes home from a hard day framing other people’s new homes, he can take a lot of pride in his home. It’s a dream. It is creating. It is a bunch of us living beyond self to radically impact an undeserving soul. It compels me. I can’t get it out of my mind. It needs to happen. I believe that is just one small example of what McManus is talking about in this chapter.